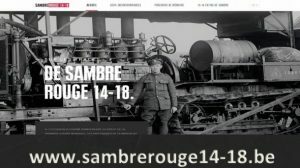 Tuesday 19th of august, the press conference about “Sambre Rouge 14-18” took place. This transmedia project (web, mobile, events) was managed by DreamWall. Schedule : presentation of the upcoming events 22nd, 23rd and 24th august with 4 different speakers : Paul Furlan (Minister and Mayor of the city of Thuin), Philippe Blanchart (President of the Tourist Office Val de Sambre and Thudinie), Isabelle Denis (commercial Director de Dreamwall) , Franck Villano (Director of the show Sunday August 24 ‘Battles of the Sambre’).